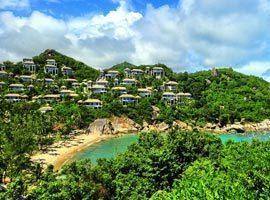 Koh Samui will bury you in reasons to visit its exotic shores. It goes without saying that sunny days spent on idyllic beaches is its most noticeable quality, but entwined in this eye candy scenery its all inclusive accommodation is a big draw. 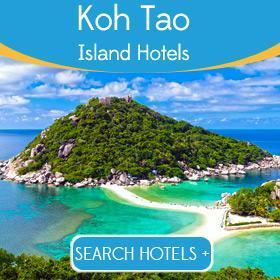 Because the number of holiday venues is so extensive we list 12 of the top hotels in Koh Samui with reviews suggesting you can book with confidence. Secondly, although the island is small enough to retain an intimate personality, it is also big enough to offer a plethora locations to serve as your base. In Chaweng you can mingle in a cosmopolitan crowd and for exclusivity the best areas to stay include ChoengMon, tranquil Bophut and seductive Maenam where hotels like W Retreat are romantic and private. Lamai is near Chaweng and has a delightful atmosphere at night, but is relaxed by day and then there are the blissfully secluded west coast beaches. Finally, you may spend the first days getting pampered at a spa or soaking the sun, but in Koh Samui there is so much to do you may soon feel a pinch of regret for not having booked longer. Snorkel and scuba, boat tours and island hopping are only some activities filling days to the brim. Besides, our generous prices means the top places to stay is more affordable than ever. Ideal for a romantic holiday Outrigger has a private beach with no public areas and offers intimate villas and suites with private pools in Hanuman Bay, moments from the conveniences of Chaweng Beach. 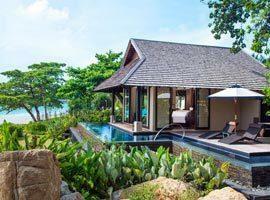 Located toward the northern end of Chaweng Anantara Lawana is outside the bustle and noise, but close enough to entertainment for convenience. Step from your villa into your personal pool. 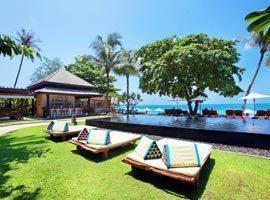 Located in a private cove between Lamai and Chaweng offering the epitome of luxury and a high degree of privacy. Enjoy exceptional views from your personal pool's deck and in-room spa treatments. 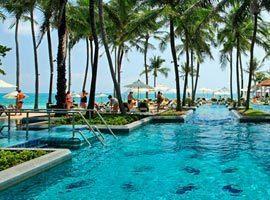 Located on the beachfront in Chaweng in the centre of entertainment with guest reviews singing faultless praises. 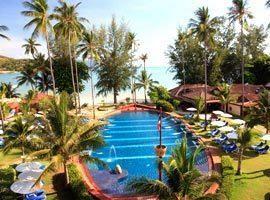 Offers a lovely spa, beachfront pool and romantic dinners at the beach club. A quiet location on otherwise buzzing Chaweng you can enjoy the old world charms of this colonial style retreat with easy access to entertainment. 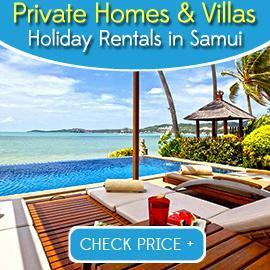 Offers a kids club, dive centre and tennis courts. Located on a private beach in Bophut offering rooms with direct pool access and villas with their own private pools The Deva is right up there with the best hotels for a romantic holiday in Samui. If you want to get original, Imperial Boathouse offers unique accommodation in authentic rice barges converted into stylish teak wood suites with en-suite bathrooms in Choengmon. 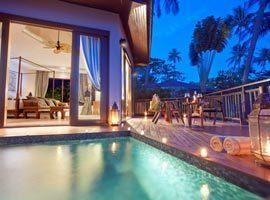 Undoubtedly the perfect places to enjoy a high degree of privacy for a romantic getaway. 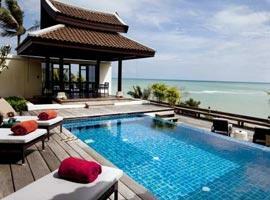 Located in Lamai Beach it offers a private ribbon of sand and beachfront pool villa accommodation. 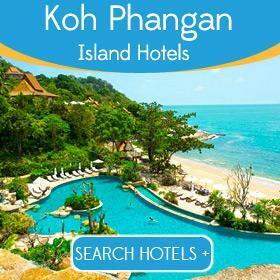 Located in Choengmon renowned for being pristine clean and known for hosting primarily top resorts. 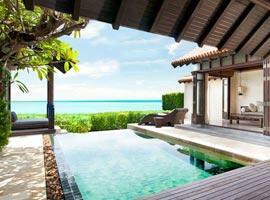 Offers villas with their own pools and romantic outdoor bathrooms in enclosed gardens. 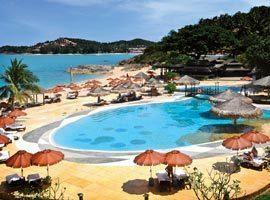 The Tongsai Bay Resort is located in Choengmon, minutes from Chaweng and has its own sandy cove for the exclusive use of its guest. 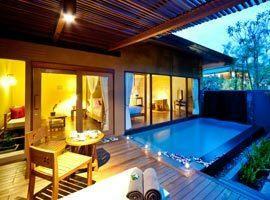 It offers romantic suites and cottages with their own pools. Vana Bell is located on the water's edge in Chaweng Noi, the peaceful south of the area and moments from the never ending buzz of central Chaweng. 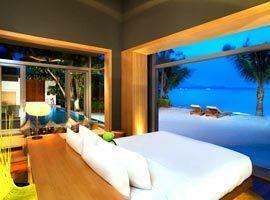 It offers exquisite villas with captivating views. W retreat is located on one of the top beaches to enjoy unspoiled nature and a romantic atmosphere, namely Maenam in the north where a brigade of beach ambassadors is at your beck and call.